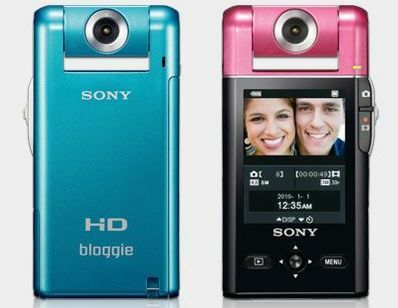 Looks like Sony’s camera line-up for CES 2011 has come out a little early and an upgrade to their popular cheap camcorder the Bloggie is on the table -it’s getting 3D recording. The new Bloggie 3D MHS-FS3 will have 3D movie recording and stereo mic according to Photo Rumours. One of the top new camcorders will also have a digital projector built in, will have two lenses and be able to record HD 3D video. Otherwise there are a lot of updates to the Cybershot digital range, but it seems there will be no new digital SLRs from Sony this year. Picture of the current Bloggie above, priced at £120. We’ll post the new ones as they pop up. I got my camera today and I was excited to take it for a test drive. My initial impression while unboxing it was how sleek & well packaged it was (the heavy thick internal box was very much like iphone and ipod). You get the camera, a usb extender cable, a camera tether/strap and the documents.